Having beaten cancer three times, there’s absolutely no doubt that 88-year-old June Craven is one tough lady. But the Wellington Point local freely admits there’s one Christmas Carol that can quickly reduce her to tears – Mary’s Boy Child. Sadly, June’s cherished boy child, Jonathan, died in 2001 at the age of 37 … a victim of cancer. This is part of what drives this 30-year veteran of the CancerFREE cause, who is widely respected throughout Redland City for her efforts to help find a cure for a disease which devastates the lives of so many. Local media oft describes her as a “fundraising dynamo”. Having endured three radical surgeries since the 1970s, she describes herself as “a true survivor” and even has her own catchcry: Craven for a cure . June will again be at the helm for the CancerFREE Challenge stalls when the carol that means so much to her is played at the huge Christmas by Starlight community concert at Cleveland on December 7. The stalls will be selling a huge range of “glow products” throughout the free event, which starts at 3pm and is designed to be fun for the entire family. Unfortunately, carols events in recent years have been targeted by “pirate” glow product sellers, who effectively hijack the event and rob charities such as the CancerFREE Challenge of much-needed dollars. Up to 15,000 people are expected at Christmas by Starlight and organisers are urging them to only buy glow products inside the gates. Security will be employed to warn off any rogue traders. 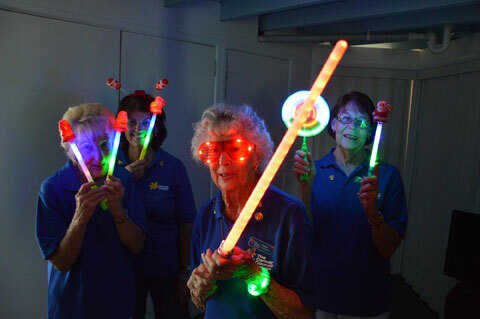 CancerFree volunteers Dell Boyd, Cr Wendy Boglary, June Craven and Del Roeton get set to light up the Redlands with glow products for Christmas by Starlight on December 7. The free Christmas by Starlight concert at Cleveland on December 7 is expected to draw more than 10,000 people to enjoy an evening of family festive fun. Redland City Mayor Karen Williams says: “Christmas is a very special time of year for families so we are making sure we have something for everyone. Christmas by Starlight will be held at Norm Price Park-Redland Showgrounds on December 7 and will feature a cavalcade of local talent, headlined by former Sheldon College student Connor Crawford, who performed to rave reviews as Frankie Valli in Jersey Boys. Also in the line-up are Kiara Rodrigues, Breanna Fielding, beat-boxer Matt Gibbs, Oliver Samson, Gina Limpus and Indea Sekula, Jacqui McLaren, Katie Green, Sarah Przybysz, Courtney Heaton, Meg McGuiness, the Sheldon College Choir and Orchestra … and even more! The event is run by Redland City Council, with the assistance of confirmed supporters Energex, Bayside Bulletin, JJ Richards, Fiteni Homes, Stradbroke Flyer, Viking Rentals, SS Signs, Mr Fireworks, Koala Graphix and Christmas Festivities. Check www.redland.qld.gov.au for a full program and details of free transport.